This post contains affiliate links. If you’re curious as to how these work, you can read more about them in my policies. The first, and probably most exciting thing when beginning formal lessons, is, for many, reading instruction. In Home Education, as Charlotte Mason lays out her approach to education for 0-9, she also gives a complete, sufficient method for reading. I have written about this approach before, and how it compares to two modern approaches, phonics and whole language, but today I’ll focus solely on the method that she suggested for a child of six or seven. Since many Charlotte Mason families I know teach the alphabet and some beginning phonics through play during the early years, I’ll skip right to the first reading lesson and give you lots of resources for teaching your child. 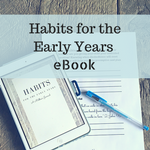 In this series of posts, I’m digging into Charlotte Mason’s volume, Home Education, to explain how she urged us to teach each subject. It looks much different than many other Charlotte Mason curricula, but I trust that this volume was Holy Spirit inspired, and this curriculum will suffice for my six-year-old. This felt like a lot to me, especially in a season where I will teach a six-year-old and have two very young children to tend to. I’ve put together a booklist that we’re using, which you can download. Sign up below to get your book list right away! My well-loved copy of Home Education. Charlotte Mason beautifully described the process, not steps, of reading lessons using a nursery rhyme that had been cut up word by word. You can do this easily with a computer and a printer. Just type out a rhyme, print it, and cut out each word. I've done this for you, as well as wrote out specific lessons, in my reading printable packs. An interesting word from the poem is introduced, and the child's interest is sparked. The word is familiar and he wants to know more about it. The parent then instructs the child to write out the word with his set of letters (I prefer wooden letters!) and then identify the word from the little cut-up rhyme. This is repeated with a clause until the child knows several words, sometimes over the course of a few lessons. Instead of just identifying and building each word, the child is encouraged to really keep the picture in his mind. Allow him some time to concentrate on the shapes and order of the letters. Her coat is so warm. The child starts by putting a sentence together, finding one word at a time as it is told to him. *I used a modern word instead of the original. The words can also be arranged in columns, so your child can practice reading them at random. Now that the child can read words as a whole, he can experiment with the smaller sounds. Today, this is often called word building. Using the wooden letters, he can spell a word in the rhyme, such as coat. By changing the first letter, he can make several other words. After learning so many new words, your child actually knows more than he thinks. On a chalk board or white board, he can write rhyming words that he knows. Once your child has learned how to read, he or she should have practice reading aloud. My biggest surprise while creating this curriculum for my daughter is the usage of poetry for reading practice. I previously viewed poetry as a completely isolated subject, but I appreciated that it could also be used to help my new reader grow. All that to say, these are the things I took into consideration when planning a curriculum based solely off of Home Education. Miss H and I have already addressed those first reading lessons, but this is what he did, and will continue to do, for reading. I'm thankful that you're joining me as I share our Charlotte Mason curriculum! The Little Bear books often come up on people’s lists of suggested first readers. I see there are others in the series but am not familiar with this series, do you know if they are suitable first readers too? We’ve collected quite a few of the Little Bear books, and they’re all pretty delightful!